Evidence uncovered on social media indicates that members of Iranian-trained Shiite militias may be entering Europe as refugees, a London-based Iraqi émigré group says. 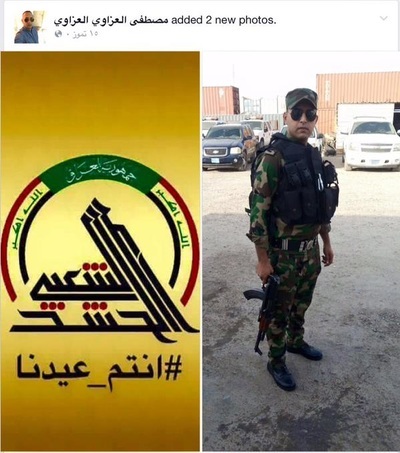 The Foreign Relations Bureau – Iraq (FRBI) identified images of 48 men on Facebook and Twitter who it says fought with Iranian-trained Shiite militias in Iraq and now are in Europe. FRBI came into existence in 2014 and promotes women's rights, equality, Iraqi independence from foreign control, and a non-sectarian approach to governance. FRBI's list shows pictures of militiamen in uniform and carrying weapons. Alongside those images are pictures showing the same people wearing Western street clothes and standing in places such as Germany, Sweden, Belgium, Greece and Finland. This same list also includes 16 people belonging to Iraq's security services who similarly made their way to Europe and who FBRI accuses of crimes against the Iraqi people. These militias engaged in serious human-rights abuses in places like Tikrit after they ousted the Islamic State, and Iraqi security forces similarly engaged in unlawful killings, according to Human Rights Watch (HRW). FRBI refers to HRW's research about human-rights abuses in Iraq as a reason why these men should not have been allowed into the E.U. Images of these fighters began surfacing on social media in August and early September, said FRBI spokesman A. Al-Mahmoud. "Our lists are compiled with the efforts of some of our affiliate analysts who follow social media of all sorts mainly militia related pages whom suddenly started posting images from within the EU as the refugee situation escalated," Al-Mahmoud said in an email to the Investigative Project on Terrorism (IPT). "A public page was then set up on our website to document what can be from these accounts in hope that media would find it easier to have what they need all in one page." Thus far, FRBI has no evidence that the influx of Shiite militiamen into Europe has been organized or orchestrated by Iran or any organized crime syndicate in Europe, but the scale of the militiamen's migration is unprecedented, Al-Mahmoud said. They may have varying motivations, he said. Some may fear war crimes prosecutions and are trying to remake themselves into refugees. Others may no longer care about their government's or clergy's goals. 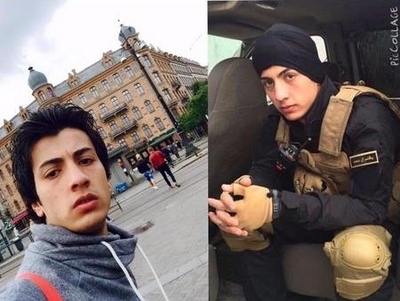 The men regularly posted images of themselves on the battlefield, Al-Mahmoud said, then suddenly began posting images showing them in Europe, which led FBRI to believe they had infiltrated the wave of refugees. No matter the reasons for their move, FRBI fears these men are on a collision course with European values and trapped by a vicious sectarian ideology that makes them a potential threat to their host countries. It alleges that some of these men may have participated in war crimes in Iraq. "[M]ost of the people who did join the militias do have sectarian leanings and they will export their irrational thought of non co-existence outside Iraq, which will collide with other open and liberal societies, so they will bring their problems with them," Al-Mahmoud said. "Finally, the background they are from is very low and poor with minimal education; unskilled and foreign, they will quickly find it easy to get into the criminal/theft and drug world adding more problems to the European Union immigrant communities already suffering from stereotyping and media pressure. "They were paid members of organizations that were trained to kill under religious banners; this is the first time they have come out of Iraq in such large numbers." The men belonged to deadly militias such as Al-Hashid al-Shaabi and its subsidiaries such as: Kataib Hizballah (aka Hizballah Iraq), Kataib Imam Ali militia, Saraya al-Salam militia (Iraqi cleric Moqtada al-Sadr's Peace Brigades) – all of which are trained and strongly influenced by the Iranian Revolutionary Guard Qods Force under the command of Gen. Qasem Soleimani. He emerged as a controversial figure in the discussions of the Iranian nuclear deal. Kataib Imam Ali militia formed from splinter elements of al-Sadr's militia that fought American forces during the Iraq War and remain "extremely anti-American," said Phillip Smyth, an adjunct fellow at the Washington Institute and an expert on Shiite militias in Iraq and Syria. Kataib Imam Ali militiamen have been implicated in human-rights abuses similar to those carried out by the Islamic State (ISIS), he said. In one case, a video showed a militiaman dismembering the burned corpse of a Islamic State fighter as if he were "shwarma," which sparked a reprisal video by the Islamic State in which two Shiite fighters were burned to death. An IPT review of the information provided by FRBI lends credence to its contention that Shiite fighters have entered Europe among groups of refugees. For example, the Facebook page of Al-Hashid al-Shaabi militia member Ali Spaaki shows a clear progression from being on the battlefield in Iraq in June to making his way across Europe throughout September and on to Helsinki, Finland on Oct. 4. Spaaki's Facebook page shows him getting off a ferry along with a crowd of people in a picture posted to his timeline on Sept. 20 in front of a Greek-flagged ferry and a large crowd. A related photo, also taken Sept. 20, shows him standing in front of a boat that reads "Bodrum" [Turkey] on its stern as its homeport, suggesting the ferry may have departed from that Turkish town. Bodrum has become a "magnet" for refugees, and large numbers of refugees have left the town hoping to make it to Greece since the summer, according to news reports. Spaaki's departure date came weeks after the body of Aylan Kurdi, a toddler refugee, washed up onshore near Bodrum. A similar story can be told by examining the Facebook page belonging to Al-Hashid Al-Shaabi fighter Mustafa Al-Azawi. There, he explicitly discusses his effort to enter Greece on the island of Lesbos on Sept. 17 via Izmir, Turkey, which news reports say is a common point of departure for refugees. Pictures on Al-Azawi's timeline of himself posing on the shore of the island and of inner tubes and a crowd of likely refugees happened the same day a Getty Images photographer captured an image of migrants arriving on Lesbos. Days earlier, on Sept. 10, Al-Azawi posted Google Maps images of routes to Lesbos on Facebook, suggesting he planned his route to the island. Like Spaaki, Al-Azawi's Facebook page shows his travel across Europe before making his to his final destination in Oulu, Finland on Oct. 3. Al-Mahmoud also worries these militiamen could become entangled in organized crime and become involved in Iranian-controlled social organizations across Europe, and they will be used for Iran's political ends. "A lot of them believe in ... Iran's guiding ideology, and that political and social matters are presided over by Ayatollah Khamenei ... so they follow what he says," Smyth said. "They (Iraqi Shiite militiamen in Europe) do pose a risk. "These groups believe that both America and the State of Israel are their existential foes." In the past, Hizballah supporters living in Europe, Canada or the United States have engaged in criminal activities. This includes cigarette smuggling in the U.S. and accusations of organized crime in Canada and in the E.U. Hizballah supporters also plotted and carried out terrorist attacks in Argentina and Bulgaria. Although these Iraqi militias are not part of Hizballah, they are branches on the same Iranian Qods Force tree – first cousins in effect. Shiites who support Hizballah and Iran in places like Sweden already have been recruited as foreign fighters by Iranian proxies to fight in Iraq, said Smyth, who traveled to Scandinavia last year on a related research trip. Having a passport from someplace like Sweden means a foreign fighter can come and go from hot zones like Iraq or Syria without the same hassles someone traveling on a Lebanese, Syrian or Iraqi passport. While most attention has been given to Sunni foreign fighters traveling to Syria and Iraq to fight for the Islamic State and other Sunni jihadist groups, Smyth said, not enough attention has been given to Shiite fighters with ties to Iran. "You now have a new transnational threat that is loyal to the Iranians, that is anti-American, is anti-Western, is anti-Israel," Smyth said. "There is a direct threat that's there." It is hard to tell how many people on the FRBI list actually are refugees or if they are in the E.U. vacationing or are there for some other reason. But Smyth sees them as a national-security threat either way. "Here are examples of these guys when they are out of uniform, when they are possibly still militiamen, and they are traveling to Europe, which says something. How did they get there with a visa? Why, after all of this has been publicized, are they all still going?" Smyth asked in a phone interview with the IPT. "There are already examples of Shia militiamen, Hizballah for instance, who have used Western passports to go different places and to engage in bad deeds." This also has U.S. Customs officials concerned. The ease in which these Shia militiamen have entered Europe raises fears that they will be able to travel to the U.S. on E.U. passports, said one Immigration and Customs Enforcement (ICE) agent who spoke under the condition of not being named. Anyone with a passport from places like Germany, Sweden can easily get on a flight to the U.S. without the sorts of hassles they might experience traveling on an Iraqi or a Syrian passport. A spokeswoman for Europe's top law enforcement agency, EUROPOL, told the IPT her agency was unaware of any organized effort by terrorist organizations to infiltrate the E.U. However, none of the Shia militia groups whose members have made their way to Europe are listed as terror groups by the E.U. "There are however concerns about the use of the Mediterranean routes. While the majority of irregular migrants and refugees are in search of safety, other groups such as returning foreign fighters and other individuals linked to IS (Islamic State), might make use of the services provided by the organized crime groups," EUROPOL spokeswoman Agnieszka Biegaj wrote in an e-mailed statement. "Given the hazardous nature of the illegal migratory routes, from a terrorists' perspective, it makes more sense to use regular travel methods and other resources such as false or genuine travel documents." Europe is on a path to suicide. If one combines the Socialist leanings, with the inability to assimilate mid east refugees, one can only conclude, that Europe is going to destroy itself.